There has been a long tradition of non-profit organizations in India, known as Non-Government Organizations (henceforth referred to in this paper as NGOs) accepting financial contributions from entities – both individual and institutional – to conduct their operations. These are filed as FC6 returns and have been made available to the public of India at the following web site – https://fcraonline.nic.in/fc3_amount.aspx ; Such FC6 returns (currently being called as FC4, post the minor amendments made to FCRR (2011) in 2015) are available online for financial years 2006-07 and beyond. The quantum of funds received has been stepped up rapidly in the last 2 decades. Especially, the graph below shows that 2004 – the year of the Boxing Day tsunami – saw a record inflow and since then, funding has only gone from strength to strength. The annual inflow is as much as Rs. 12,000 crore/year. The FCRA regulation makes it mandatory for the return to declare if the recipient of funds is a social, cultural organization and if it has a religious association. If it is associated with any religion, it is mandatory to declare if it is one of the religions of India – i.e., Hindu, Muslim, Christian, Zoroastrian, Buddhist, Jain or Baha’i. We notice that 35% of total funds are received by organizations that explicitly declare their religious affiliation. In the case of remittances from the US, it is possible to identify the American entity and understand their nature by means of the Form-990, the tax return which 501(c)(3) non-profit organizations there have to file, which details the nature of the organization. Such forms are available in public domain. Studying this information, we come to the conclusion that significant number of donors are partisan in nature and donate monies in the pursuit of specific agendas. The bulk of funds received from abroad are from institutional donors. Many of them are charity/non-profit organizations themselves. While media attention is focused on such high-profile donors as Ford Foundation or the Bill And Melinda Gates Foundation, one may note that the large donors are less prominent – Gospel For Asia being one example. There are other donors with wider reach and impact, such as Oxfam, Action Aid, Cordaid and World Vision which are, for unknown reasons, totally exempt from media scrutiny. While performing detailed analysis, some independent analysts have discovered the existence of ‘control organizations’, i.e., large recipients that are registered in one particular location and which then distribute proceeds to smaller organizations on the ground for effecting change. Certain States – Tamil Nadu and Kerala, especially, demonstrate a preponderance of such control organizations. We have also noted that, cumulatively, the FCRA registered NGOs accrue roughly Rs. 600 crore as interest earned on deposits. Thus, we can conclude that all NGOs have a cash reserve of roughly Rs. 6000 crores in India. Returning organizations are required to supply information on expenditures as part of FC6 returns. It is the last mentioned activity which yields interesting results upon analysis. One such unusual use to which funds have been put to is purchase of land. Annually, about Rs. 50 crore is spent by FCRA NGOs on purchasing land. One organization – The Church of Jesus Christ of Latter-Day Saints or LDS, popularly known as Mormons, spends Rs 10-15 crores per year and in one year – 2012 – spent Rs 100 crores on purchase of land alone. Given this background, let us delve into one of the main topics of this paper – that of interventions in the functioning of judiciary and legislature by these NGOs. 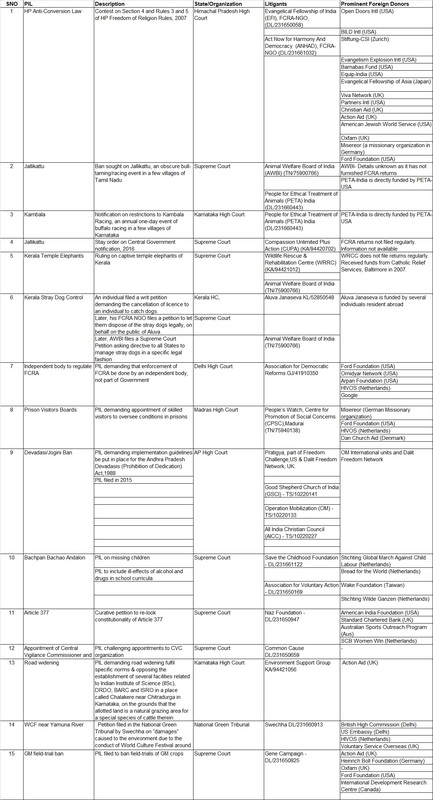 This table below shall be useful as an introduction and ready-reckoner for information relating to judicial activism engaged in by said NGOs. We thus notice that a lot of controversial litigation has emerged from foreign funded NGOs. We can accept that judicial activism is part of NGO activity aimed towards achieving goals of social justice. In this context, we wish to highlight the body – National Advisory Council – set up by the UPA Government to function as an advisory body for the Prime Minister’s Office. It was headed by the President of the Congress Party, Smt Sonia Gandhi. During the period 2004-2014, this body drafted many of the significant laws passed in Parliament, including the Right To Information Act, the MNREGA, the Right To Education Act and the Food Security Bill. We present a few of the NAC members with long-standing links to organizations that had received contributions from foreign sources. Shri Harsh Mander – who has served as Country Director, Action Aid India, and is on boards and advisory committees of other NGOs also. Smt Teesta Seetalvad – She was drafted into the NAC to advise on education policy. Her NGO, Sabrang Trust (MH/083781099) is a recipient of FCRA funds. Shri Ashis Mondal – Director of Action for Social Advancement (MP/063203120), which has received funds from Ford Foundation, HIVOS and from the Lutheran Church. Thus, we see that individuals with financial links to foreign powers were primarily involved in drafting laws for the Indian people. This organization was funded by International Foundation for Electoral Systems (IFES), which in turn was funded for this project by USAID, an Agency of the US Federal Government. The European Women’s Lobby was also involved in a guiding role. As a sample, we wish to highlight some of the activities that are typically conducted by the executive arm of the Government being taken over by NGOs. The childline service – 1098 – for children to call in case of an emergency is well known to many of us. What is less known, however, is the identity of the organizations that operate this childline. The list of organizations that operate the childline is listed for each district of India here. We thus see that this entire service, which ought to be a function of the Government, is run by NGOs funded by foreign sources. 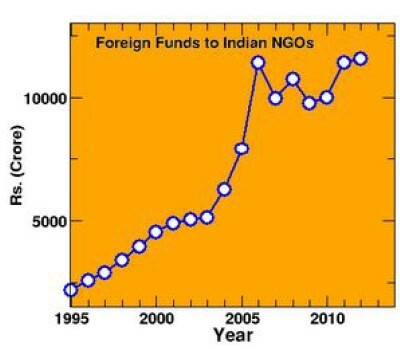 The foreign donor organization mentions the activities of the Indian FCRA-NGO in its (former’s) annual report to its (former’s) Government. The Indian Government too advertises Childline NGOs as if it is its own work. In our opinion, this tends to blur the division between the Government itself and agencies contracted for carrying out functions of governance. People’s Watch, a Madurai-based NGO, has filed a law suit demanding that a Prison Visitor’s Board be established to set up a committee of specialized visitors to counsel prisoners. It is registered as Centre For Promotion Of Social Concerns, FCRA Reg no -TN/075940138. Further, this particular NGO is led by Henri Tiphagne, first Indian to receive the Amnesty International Human Rights Award in 2016. It is also common knowledge that aggressive conversion and proselytisation is carried out in prisons. Thus, this, in effect, means that foreign donors are explicitly demanding the right to proselytize in Indian prisons. We earlier saw how the RTE act was drafted by the NAC, composed of persons associated with foreign-funded NGOs. Next, we see how the RTE act, which does not apply to minority-run educational institutions, is enforced. The RTE Forum and All India Forum for RTE, have been convened as loose unions of NGOs. Their focus is on vigilance over majority institutions to ensure that they implement the RTE. The do this by constant monitoring and filing suit, through media intervention. A quick glance at many of the organizations show that they are indirectly or directly funded by foreign governments and foreign agencies. Interestingly, the individuals enforcing RTE often would not need to comply with the Act in case they ran schools of their own! In the case of the Kudankulam protests, the actual protests were run by the People’s Movement Against Nuclear Energy. However, it was shown by the then Government that the movement was supported by the Tuticorin Diocese Association, Tuticorin Multipurpose Social Service Society, both of which had received significant funds from abroad. The latter is also run by the Bishop of the Tuticorin Diocese. In the case of the Niyamgiri mines, since Vedanta is a company headquartered in the United Kingdom, the protests abroad were led by Survival International. Weaken the Government’s standing in implementation of policies and laws. Weaken native Indian control over educational and social services. Hamper economic growth, when protests are conducted on the basis of human rights, ecological and social justice grounds, but could be directed by foreign forces inimical to the Indian Republic. The most effective form of controlling subversive activities in the name of social service would be to not allow foreign funding for non-commercial activities. The total sum of remittances for non-profit activities has never been more than US $2 billion. In a US $ 2 trillion economy, this quantum of money can be raised through domestic sources, without having to compromise on national self-respect and sovereignity. The outlay for CSR spending is already Rs 5000 crores per annum. This is comparable to the remittance of Rs 7500 crores in the current fiscal year through the FCRA route. The FCRA Act already stipulates a list of activities that can be allowed for foreign fund recipients. Successive Governments, since 2012, have enforced this law by cancelling FCRA registration of NGOs that flout norms, thus rendering them ineligible to receive funds. It is mandatory for banks to report on a regular basis to the Ministry of Finance and Ministry of Home Affairs of foreign remittances made to entities registered as non-profit.GoI gets real-time data via PFMS. Banks have to report to GoI within 48 hours. FCRA-NGOs have to submit quarterly reports. The Government validates if all 3 reports tally. Make it illegal for organizations which received foreign funds to further distribute it among other NGOs. NGOs must utilize funds themselves, not serve as conduits for other entities. In case this practice is continued, the second recipient FCRA-NGO must not only provide the name of the donor FCRA-NGO in the FC4 return, but also the latter’s FCRA registration number. Organizations that receive funds from abroad must declare themselves as sectarian, if their donors are sectarian. Make it mandatory for non-profit organizations that receive foreign funds to supply their FCRA registration number to the bank in order to be eligible to receive funds. Extend the FCRA or pass a new Act on the lines of the United States FARA (Foreign Agents Registration Act), 1938. The Act requires periodic disclosure of all activities and finances by: 1. people and organizations that are under control of a foreign government, of organizations or of persons outside of the United States (“foreign principal”), 2. if they act “at the order, request, or under the direction or control” of this principal (i.e. as “agents”) or of persons who are “controlled or subsidized in major part” by this principal. Pass an amendment or a new Act on the lines of the United States Lobbying Disclosure Act, 1995, that shall: 1. Define who or what a lobbyist is 2. Ensure that all lobbying activities that affect the functioning of Parliament be disclosed and recorded with the Parliamentary Affairs Secretary. Additionally, we also recommend that all such information that has been collected by various arms and Ministries of Government be shared publicly, for the general public to access. Currently, this is being done in a haphazard manner. For instance, nobody except the Government knows who own the 22,000 odd FCRA-NGOs. A greater transparency is needed, via the push model (i.e., information must be available without anyone seeking for it). These roll up into generic categories such as -Social/Religious/Educational etc. In recent years, the return has been simplified to only include generic categories. Should Hindus Be Offended at the Republican Party Ad Featuring Lord Ganesha?